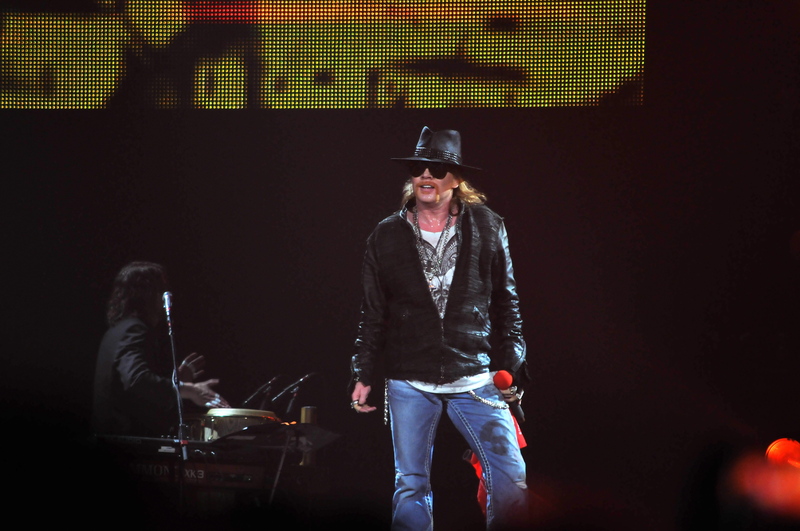 The latest version of Guns N’ Roses invaded the Copps Coliseum Monday evening. This marked the band’s second appearance at Copps, their first since January 2010. Despite a chilly, damp night, the faithful Hamilton crowd had a pretty hefty walk-up and the building filled in comfortably by the time Axl Rose and Company hit the stage. Flanked by the three guitar assault of DJ Ashba, Richard Fortus and Ron “Bumblefoot” Thal, the band also included bassist Tommy Stinson, drummer Frank Ferrer and keyboardists Chris Pitman and Dizzy Reed. Reed being the only member that goes back to the Use Your Illusion era. Approximately forty minutes after opening band The Pretty Reckless finished their set, the band took the stage precisely at 10:45 PM, a little on the late side in this day and age considering most arena shows end around that time. The band then proceeded to play for a solid two hours and forty-five minutes, giving those in attendance more than their money’s worth. They began with the title cut from “Chinese Democracy” before giving way to a spirited “Welcome To The Jungle”. “Live and Let Die”, the Paul McCartney cover featured a full blast of pyro that really made the song come alive. The band did a great job mixing in newer tracks with older ones throughout the show. An effervescent version of “You Could Be Mine” made one wonder, why didn’t they open with this song, it seemed to be the perfect choice. The guitarists all took turns performing solos, Bumblefoot delivered a gem during his which was sandwiched between the Pink Panther theme amidst the stage being flooded with pink lights. This latest version of Guns N’ Roses may very well be the best line-up Axl has put together, perhaps even giving the original classic lineup a run for their money. extracted from the latest release “Chinese Democracy”. As the show wound down the band closed with “Patience” and “Paradise City”! There have been many detractors and naysayers who continue to not give any non-classic GNR lineup a chance. After witnessing this show first hand I can honestly say to anyone who has any doubts, go see this band if they make it anywhere near your backyard. You will surely not be disappointed. Special Thanks to Kymm Britton for her help in making this review possible.